Waterproof computers, IPC's and industrial computer enclosures for food processing companies and general manufacturing companies. Industrial computer provides the ability to use computers in hostile environments such as factory floors. Use a Waterproof enclosure to protect computers and PC’s. Our 316 stainless steel enclosure are sealed to IP65 and will accept up to a 19” screen and processor unit. In wet areas a Waterproof enclosure and desktop PC is the low cost alternative to an Industrial PC. Armagard's LCD enclosure range are designed to accommodate a large variety of commercial LCD or plasma displays, ranging from 24" to 50". Industrial PC for computer protection in factory enviornments, industrial pc's built to IP54 standard ensuring protection in dusty, hazadous environments. Armagard's Plasma enclosure range are designed to accommodate a large variety of commercial LCD or plasma displays, ranging from 24" to 50". 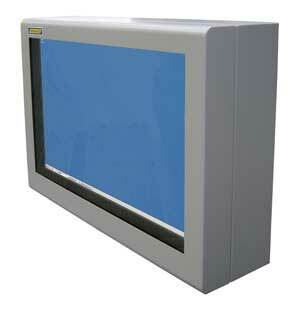 Panel PC providing secure computer use in factory environments whether it be dusty or wet. Slimline enclosure and touch screen provide a elegant wall mountable industrial solution offering touch screen technology at an economic price. Protect PC's in an harsh environment with a Computer Enclosure they make your desktop into a rugged PC using a computer cabinet made of steel. 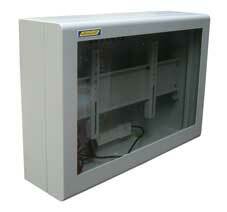 Our pc enclosure is made of steel with a filtered air supply. Computer cabinets and computer enclosures to protect desktop pc's in the workplace. Both stainless steel and mild steel computer cabinet solutions. In wet areas use a waterproof computer protected by a stainless steel case or simply protect a desktop PC with a stainless steel enclosure sealed to IP65. These waterproof computers have the capabilities of a Industrial computer but are waterproof. Waterproof keyboard and a industrial mouse. Truly resilient Rackmount keyboard and TFT console draws specifically designed to use in hazardous environments with built-in mouse. Waterproof Industrial Bar Code Scanner sealed to IP65 in a stainless steel case. Case Study of PC Guard - Customer application of stainless steel PC's and waterproof barcode scanners. IP65 what is it? and how much protection does a nema 4 cabinet offer? If you have any questions use our contact page or visit the frequently asked questions page (FAQ) or our site map may help. Computer Enclosures - protect desktop PC's in an industrial environment. Waterproof Computers - Stainless steel IPC sealed to IP65 / NEMA 4. PC Protection - using Industrial Computer Enclosure. Stainless Steel Computer Enclosure Case - Protect desktop computers in hose down areas. Industrial Keyboard - Sealed rubber keyboard and mouse. IP65 and NEMA 4 - What does it mean?